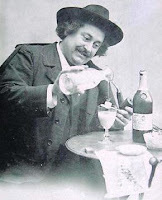 I'm sure you have heard the news: Absinthe, that most demonized of all drinks, is back. Not only has it returned, it appears to be all the rage. We will spare you the usual blather and cut to the most important question: Should you buy a bottle? For starters, you probably won't be able to find a bottle of the two most heralded brands in this area just yet, at least we couldn't. But we did find two brands worth considering. The first "Absente" has all the ingredients, and is made in the same way, as traditional absinthe, except that the grande wormwood has been replaced with southern wormwood. The importer claims that it is still a true absinthe and Falmanac is inclined to agree. The Second, Green Moon, is a "French vodka with Absinthe essence." And how does it taste? Like licorice mostly. There are other ingredients floating around in there, and your palette will find them in due time, but if you don't like licorice (anise actually), don't bother. I found Absente to be an interesting concoction, simultaneously repellent and compelling - a lot like life in general. And I kept drinking. Green Moon wasn't to my liking at all, though I think it would agree with those who enjoy the taste of flavored vodkas. My testing partner, who doesn't like licorice, didn't care for either and quickly switched to Wild Turkey. "But it was fun," she said, "the little ritual with the spoon and all." And I think that's the answer: Yes, buy a bottle, it's fun to try, but keep a backup drink on hand. What better way to spend a long winter's evening with friends, Pictionary? Bah. We will write part 2 of the story when the two "authentic" absinthes available in the U.S., Lucid & Kübler, reach the local market. I am green with envy. I asked for absinthe at Beltway Fine Wine in Towson and they sent me to the Amaretto aisle because, you know, they both start with the letter 'A'. They could at least have sent you to the Anisette aisle - that begins with A.